AKE BUENA VISTA, FL – Longtime volleyball leader Bruce White from New Orleans, LA, has been named the recipient of the prestigious Jack Schatz AAU Volleyball Award by the Amateur Athletic Union of the United States, Inc. (AAU). The Jack Schatz Award is presented to individuals that have shown an outstanding commitment to the development of the sport of volleyball. 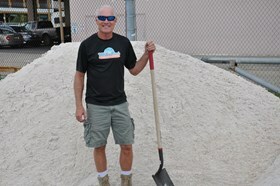 White has been a staple in the New Orleans, LA community as the owner of the White Sands Beach Volleyball Center in Metairie and the former partner of the Coconut Beach Volleyball Complex. He is responsible for the development of AAU beach volleyball in the area as well as a recognized leader of the game nationwide. White has been involved with AAU Beach Volleyball as the Zone B Director and Southern AAU District Representative. In addition, White has hosted and directed the AAU Junior Olympic Games Beach Volleyball competitions in New Orleans as well as numerous district and regional events. In 2015, he will be hosting the AAU National Classic at the White Sands Beach Volleyball Center.